All the States/UTs have been advised to observe Swachhta Pakhwada activities in schools, during 15th September, 2017 and upload them on Google drive on day to day basis. In accordance with the decision taken in a meeting chaired by the Cabinet Secretary, it is also suggested to organize camps based on Swachhta theme in the villages by schools/educational institutions. The services of NSS, NCC, Scouts & Guides student volunteers, for mobilizing citizens to participate in activities during the Pakhwada may also be utilized for this. These volunteers could focus on tourist spots and Archeological monuments during the Pakhawada. Cir. No.Spl/B5/2017; Date : 30.08.2017 :: Sub: School Education - Pledge of Swachhta Pakhwada programme on the first day of Swachhta Pakhwada programme everybody in the school i.e., teachers, students and non-teaching staff and take oath in the school prayer - Instructions Issued – Reg. Ref: 1. Mail received from the Commissioner & Director of School Education, TS, Hyderabad dt: 30.08.2017. All the Mandal Educational Officers and Headmasters of high schools in the District are hereby informed that in the reference cited, the Commissioner & Director of School Education, TS, Hyderabad has informed that on the first day of Swachhta Pakhwada programme everybody in the school i.e., teachers, students and non-teaching staff and take oath in the school prayer and take photos on pledge activity and submit to state office by 04.00 PM and duly communicating copies of Swachhta Pakhwada pledge and day wise proforma. While enclosing the copies all the MEOs and Headmasters of high schools are requested adhere the instructions and submit photos of pledge activity to this office by 02.00 PM on 01.09.2017 & 02.09.2017 to deomahbad@gmail.com mail id to take necessary action immediately. - Swachhta awareness message to be posted on the website of the Department/Organisations/Schools. Swachhta Shapath function may be organised on very first day of the Pakhwada i.e. lst September, 2017, wherein all students and teachers/staff may participate. - Class exercise, where every child will promise to take up one activity for personal/ school/ community/ home cleanliness. - Holding meeting of SMCs/PTAs or between parents and teachers on second . day of the pakhwada to highlight the importance of cleanliness and sanitation among children and teachers; and to encourage and inspire them to continue with the good practices for hygiene and sanitation in school as well as home. - Children to speak about swachhta in morning assembly. - Teachers to inspect sanitary facilities in each and every corner of school/institution and make proposal/plan for upkeep of the facilities. - Drive to clean schools/ institute on large scale with the help of students/teachers/staff. - Children should be taught pr~per method of hand washing before eating. - Teachers and students in association with local representative should propagate the theme of the Pakhwada among citizen in nearly areas. - Audio visual programme to be undertaken to motivate students/employees and other for maintaining cleanliness. - Learning impact on Health from hygiene practices. - Supplementary Book material on Hygiene. -Students will be taught the hygienic manner ofusing toilets. - Schools may include Swachhta in the agenda of the meeting of their School . • Check wastage of water. • Water from Handwashing unit to be channeled in gardens. - Increased focus may be given on community participation for the Swachhta Abhiyan in schools/institutions and teachers may also be involved in undertaking cleanliness and awareness drives in nearby areas. - Sloganeering with School March. - Children to write letters to Sarpanch, SMC Members for maintenance of school Toilets and Schools. - Children to write to their parents regarding what they have learnt in the past few days and what they want their parents to do. Some of these letters should be documented by each state and sent to MHRD. - The District Collectors in their State/UT, who are the ex officio Member Secretary of district Level Committee for SSA/RMSA/MDM, may hold meeting of the District Level Committee chaired by the local Hon'ble Member of Parliament, to further propagate the message of the Pakhwada across the society. Officers/School Inspectors etc. to address the State school children. - A "Slam Book" of School with experiences during this cleanliness journey with Photographs, messages from Children. To ensure participation of all children, one page per child may be allotted to fill their "Swachh Moments". - All Schools/educational institutions may sum up their activities and work undertaken during the Pakhwada and select best activity for forwarding to district /state authority for uploading on the website i.e. in public domain. 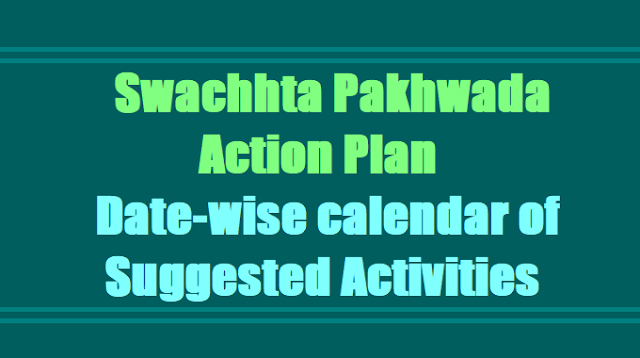 Swachhta Pakhwada Action Plan date-wise calendar of suggested activities in Schools,Swachhta Shapath Day,Swachhta Awareness Day,Personal Hygiene Day,Toilet Awareness Day.